On Mindfulness: This Moment In Time. and all of the miracles. I am certain this is not news to anyone that trying to live a philosophy or concept you believe in 100% can still be trying. For instance just the day to day logistics can try to get in the way, and old habits are hard to break even when you want to. Some say Being Mindful of the Moment is just an expression, I disagree. “No surprise there” I hear someone saying. it’s true I believe mindful is a verb. I often use to find myself feeling needy of knowing what tomorrow would bring. Today I know this is a feeling I do not have to react to, it is not my need to know what tomorrow will bring. Because in all honesty my future is not where I want to be. I want to be mindful of just this moment. I want to be fully present in the here and now. But because often with that needing to know I could also make myself wicked crazy waiting for the answers. It has only been in the last decade of my life that the realization and wisdom come to me that fretting over what tomorrow or even hours from now will bring serves no rational purpose. Least of all it does not serves me. I’ve researched, studied, observed, absorbed, and experimented with ways to help myself remain mindful of Staying in the Moment. I needed some lessons, teachings, or maybe some magic tricks that would help me remember to be mindful. Once I had some logistics in place, some ‘teachings’ I could grasp, that which allow now to be gently reminded to remain in this moment by practicing these lessons daily. Practicing even one of these teachings helped me remain grounded, to retain a balance in my small world in the beginning. I say go slow.. It was quite remarkable how when I chose just one teaching that seemed like magic in that it helped decrease my level of predilection for wanting (read need) to know what the future is going to bring. In the spirit of this blog I’d like to share the teachings that work for me. My wish is that you are able to take something away, and please be welcome to leave something behind in your comment. I wear or carry “totems” (an Native North American term) sometimes also referred to as prayer beads, worry stones, or even amulets. My affinity for doing so came from my youth. I found great comfort in a “smoothed by time” river rock in the shape of a flat heart. I found beautiful comfort in holding its warm stone between my forefinger and thumb, or in the closed palm of my hand. I loved the connection with earth as a girl, I treasure it now as an adult woman. *On Mediation: I prefer to mediate regularly; typically it is once every day for at least 15-20 minutes. I found it is that regular practice of meditation that really starts to shape my mind and the way it works. I have heard that this has been backed up by the latest brain studies. I find it easier to maintain focus, have that stillness of mind I am looking for. Being mindful is becoming my norm. Journaling: This is probably not a surprise to those of you who know a bit about me. Keeping a daily journal of my goals and my accomplishments while articulating (what I like to think are wise thoughts) into my way of living can be remarkably effective. Absolutely it’s a habit that requires practice. A lot of practice. Journaling at night when I can’t sleep and reviewing in the morning helps keep these teachings alive throughout the day. Reminder Notes: By placing inspirational/motivational notes, and self-affirmations around my small world (as done even on this post) these become helpful reminders for staying grounded and not getting distracted. This can be favorite quote, important concept, notes from loved ones, or even a short narrative or a poem. A personal favorite are two prayers sent from a very good friend who is one of my spiritual mentors. Mind-fullness Alarms: I loved this teaching especially when I began my quest of mindfulness. Although I don’t do this as a norm anymore; setting alarms to go off at regular intervals throughout the day can be a very effective teaching to help kick-start good mindful habits. This is especially helpful when marathon writing by the way. Having that reminder alarm helps me to get out of my head for a time with regularity. It is also important I believe to note of what to be mindful of. Buddhists refer to this as the Right Thought and Right View. Things that consume us during the day, like anger, fear, worry, or frustration, comes from unwise or misguided perspectives. Having a wider & more open mind to other perspectives than our own is a big help. I heard once about a very effective practice of referring to the issues of certain circumstances in our life as “third-world problems”. This is short-hand for a reminder that while dealing with issues we think are monumental, we might instead be mindful that there are people in our world who don’t have access to enough to eat. It is all about perspectives. 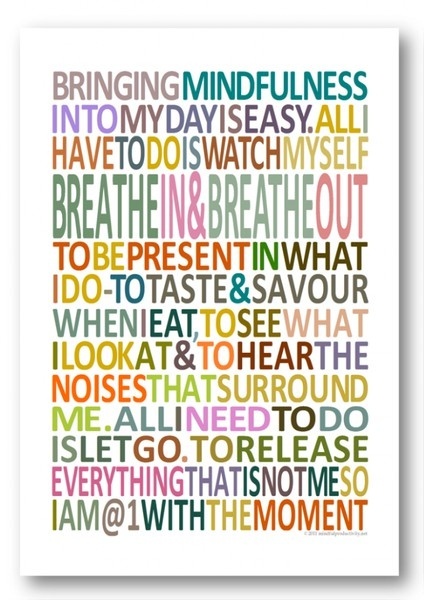 Can this kind of daily practice of mindfulness achieve a state of bliss In The Moment? So….I think… I shall stay right here in this moment….this here and now – and absorb it for all its worth. And this moment in time? I have noticed a bit of a strange happening across our blogosphere lately, I thought I’d share my observation and maybe incite some dialogue here at Barefoot Baroness. Who knows, you might even blog about the same thing. And that right there is the rub of which I’d like to focus my thoughts on. Is this a form of flattery? When you have worked to create something with that hope that there is original thought some where in your piece, and that it’s also worth sharing. You hope that you will strike a chord in a reader’s heart. Thirdly, you also ask yourself; how much has this been done? How many posts like it are there? It’s a relative question in my mind. Once this criteria has been met only then publishing is a real possibility. But if these three questions needing to be addressed, or any one of them are not met whats does it mean? You have met the first two; you have your original thought, or the way you present it is different enough. And of course the topic and its contents are worth sharing. Now what about the 3rd point? How often and close to your own blog has the topic been done already? It matters a lot to me, and to some of my fellow bloggers who have been having an ongoing discussion about just this point. I am no doubt going to catch a wrath for writing this, going out on a limb. I am a rebel and I am used to this. That being said, I have to add that I find someone who follows me, and then who creates a post so like my own to not be the least bit flattering. I question why? I have to wonder why? Is it flattery in their minds? Or is it just imitation? I honestly feel that after I have developed the idea, creating the post which in my case is always a personal narrative on what my thoughts are, and should not be up for grabs. My work from my outline, research, the message & the take away, all are which I want my post to stand alone on. And to me, maybe most the important aspect is that it is original work. Both in thought & content. I am not the least bit flattered when another blogger/writer grabs what they like from another’s work and takes off on their own with it. Imitation is not the best form of a compliment in my mind and heart, and I would think that since most “WordPressers”are writers who are “hip” to the idea of original and innovative work, I tend to believe that this is what they also want. This is not a new concept. I accept that inspiration comes in many forms, from thousands of places. I support finding inspiration where you can, when you can. Your own muse could be right beside you. What or who my muse is can change tomorrow from today. It always does as I go through my reflective writing about his life. Now you all may say I am eating sour grapes here and maybe so.. not sure I’m ready to give you this though….. just not sure. I am at a stand still in terms of what to think or feel when I and others I follow work hard on posting original content and topics only to find the next day that a reader has used the same topic, if not the same copy. I’m curious… what do you think? I love life’s progression. How things unfold themselves for you if only you keep your heart open to possibilities. I love waking up on the morning of a new day and finding welcome words in my email. I am blessed that it happens almost daily. I am a very blessed woman there is no doubt. There are happy messages, messages from friends that have been far away, but feel close to home now, messages from family, and then there are the messages that rock my soul. I received two messages this morn that rocked my soul. One of from a friend you all know. The Universe. Now I realize these messages are somewhat tongue in cheek., and I say somewhat because I have not been able to understand how the messages I receive are so relatable to what is happening in my life. Things not many, if any know. Things I do not share. Not once or twice but on a regular basis. The Notes From The Universe that I receive are always spot on. If I was not a person of strong faith it might even cause me to be suspicious. But I am not the least bit concerned. It has happened so often, and touches something so deeply felt that it will set me back in my chair and cause me to have to so sit back and reflect; How does this happen? Is there a little bird that sits on my shoulder with me everywhere I go? In everything I do? How else then? Thankfully, I know it is not necessary to have all the answers, as long as my faith carries me. I’ve really stopped asking and just started accepting. And believing even more in dreams & hopes. The Notes From The Universe that I receive are being fed my life’s imprint from somewhere, someone, something, and are more powerful than I. “Well, Barefoot Baroness, by this point in the day, if my calculations are correct, I expect you’ve already begun thinking of yourself as “mere mortal.” Somewhat alone, a little bit confused, and responsible for figuring out how to make your life take off. So… just thought I’d send you a reminder that at this very moment, there are a million eyes upon you, grateful for your courage; that you already know all you need to know; and that whether or not you can see it, you’re already soaring. Cee would love to have you all jump on board. Starting any where is a perfectly acceptable. Don’t let that stop you. Go on.. give it a try. If you find it’s not your thing what have you lost? Cee’s Share Your World question’s this week. 1. Do you believe in the afterlife? Reincarnation? Really? In how many pages I should have to share? Yes. I believe in all things possible. 2. For your computer Mac or Windows-based computer? Desktop, laptop or other? Windows, Laptop Gave my desk top to kids last year and have not regretted it,I’ve never even used a MAC operating system..hmm…maybe I am missing something?…….Nah! 3 If you could witness any event past, present or future, what would it be? My grandchildren’s births again.Historic for me. 4. What are you reading fiction or non-fiction or studying and would you recommend it? Patricia Cornwell: “Black Notice“ Richmond VA Chief Medical Officer’s nightmares begin when a cargo shop arrives at the shipyard’s water terminal from Belgium – holding a deceased stowaway. Always a good read. Writing Life Stories by Bill Roorbach – pretty self-explanatory. The first writing exercise Bill has you attempt is writing about the first home you lived in as a chid, & your neighborhood. He suggests you start with a sketch. I was blown over, time and time again ss I drew. Memories would flood over me. By the time I moved to the narration I had so much material I then had to sort. pretty cool. Thanks Cee! It’s always a party! ~no one should listen to Cream do “I Feel Free” At 2:30 in the morning unless it’s a party Right? The piece above I am afraid I have no clue the source. It has been many moons since I tucked this away in a hard bound journal of mine. Tonight/today I see it again as it tumbles out of the book. I’d even forgotten I had it. I do that find or jot down quotes, little tidbits that speak to my mind, heart and soul. My goal is to one day gather them all from their own little stash place and put them in book. This has been my plan for as long as I have been collecting these kinds of snippets. and that has been longer than I am willing to admit here. I’ve just now decided it should go on my blog, even though I cannot give credit where credit is due. If anyone has any information I’d greatly appreciate it. I hope these words have an impact on you as they still do me.